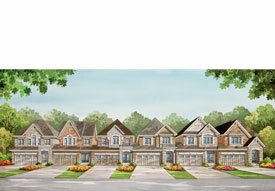 LUXURY LINKED SINGLES AT YONGE & GAMBLE ROAD! Introducing a new release of 89 luxurious townhomes including linked singles, 2 storey & 3 storey towns, many backing onto rich conservation lands, at Yorkwood's magnificent new Hillside Manors community in Richmond Hill. Hillside Manors is surrounded by city conveniences, yet retains the charm of small town Ontario. Register now for priority preview!